There is little mystery in Aruba weather. Weather forecast links open in new window. Travelers always want to know what to expect in weather at their destination, and for them the Caribbean island Aruba is a weather-conscious vacationers dream come true. Aruba is located just a dozen degrees north of the equator, and, not only is the weather report for Aruba incredibly consistent, even the sunrise and sunset are at about the same time year around. Aruba weather is some of the most consistent of all the Caribbean islands. Temperatures are remarkably constant, with the average difference in day time highs and night time lows a very small 8°F to 10°F (4.5°C to 5.6°C) year around. Average daily high temperatures vary from a 84.7°F (29.3°C) in January to just above 89°F (31.7°C) in August and September. The average lows year around are between 75°F (23.9°C) and 80°F (26.7°C). The record low is around 66°F (18.9°C) and the record high of about 96°F (35.6°C). The overall average is a moderate 82°F (27.8°C), and dont be surprised if this is exactly what comes up when the Current Weather: Aruba forecast is checked above! Rain is moderate and there are far more dry days than wet ones. There are only 62 days per year on average with greater then 0.40 inches (1 cm) of rainfall. Overall, this Caribbean island gets only about 20.3 inches (51.6 cm) or rain per year, with most of that rain (9 inches) coming in October, November and December. While hurricanes and tropical weather always come to mind when considering a Caribbean island destination, Aruba sits outside the main hurricane zone and is rarely affected. In fact, over the last 136 years of so, only 20 times have a tropical storm system passed within 60 miles of the island. 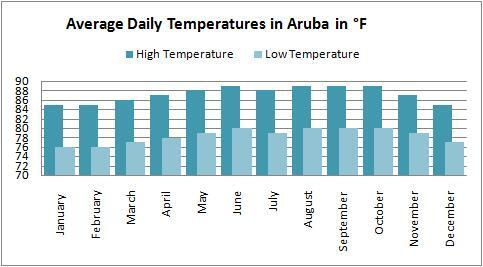 Aruba weather has only suffered 5 direct hurricane hits in that time span (that is only one every 27.2 years). The trade winds blowing across the island prevent big storms from building up and make the one that so dissipate quickly. These same trade winds cool the island and help keep it comfortable. Windsurfers and sail boat enthusiasts enjoy the recreational opportunities of the trade winds, and sun worshippers find pretty strong sunshine everyday from about 11AM to 3PM. The infrequent and short rains coupled with the mild temperatures are ideal for nearly any outdoor activity any day of the year. The weather in Aruba is so predictable that most newspapers there dont even bother with reporting or predicting it. The Aruba weather makes it easy to know what to pack and even easier to enjoy a visit there, from January through December. This site is not directly affiliated with Jimmy Buffett, Margaritaville.com, or Radio Margaritaville.